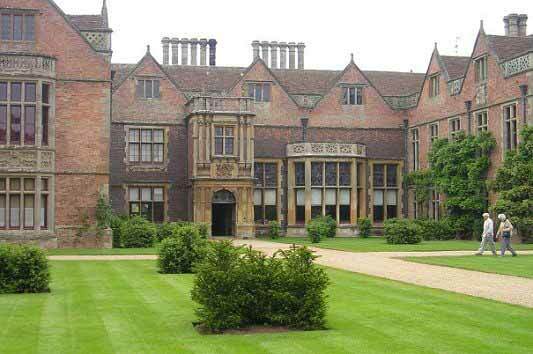 The grounds of Charlecote are notorious as the spot where Shakespeare is said to have poached deer and the owner of the original house Sir Thomas Lucy, noted for his temper, is lampooned as Justice Shallow in “Henry 1V Part Two. The house was originally built in 1551 and Lucy entertained Queen Elizabeth the First here in 1572. The original grounds and gardens are lost as Lancelot “Capability” Brown uprooted everything to make the parkland that we see today. So where’s the topiary? 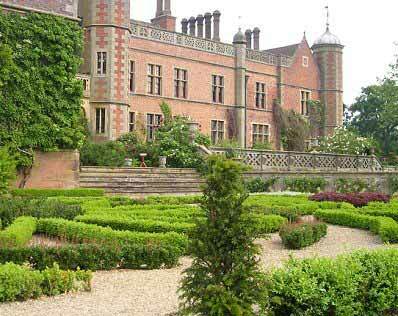 Sir Edmund Fairfax-Lucy with the help of the National Trust have recently laid out an Elizabethan style parterre on the river side of the house and planted yew trees between the gatehouse and the main door which have every chance of being an imposing site once mature. 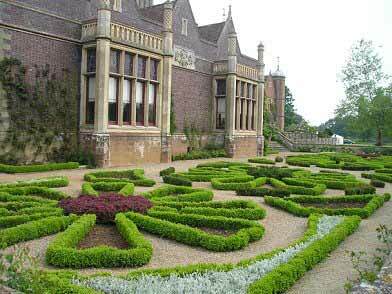 Sir Edward’s parterre was planted in 2000 using the materials of a traditional “Green Court”, i.e. grass, yew and box.